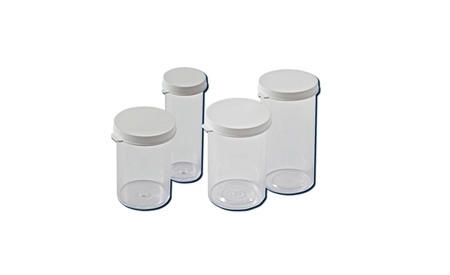 Snap Cap Containers are molded of rigid-wall styrene containers with tight fitting polyethylene snap-on caps. Excellent for storing dry materials, powders, tablets, etc. Approximately 16 drams per ounce. 7 dram size may be used with automatic cell counters for collection of sample and, where venous samples are used, for dilution purposes. Maximum temperature polystyrene is 70°C.